I have installed Tor Browser Version 7.5.6 - OS X (10.9+) for my Mac Book Pro, but can't start the browser. I click "Connect" and "Remove settings and connect" but I get the errors that I have pasted in this post. 13/07/2018, 20.51.53.000 [NOTICE] You configured a non-loopback address '10.0.0.1:9150' for SocksPort. This allows everybody on your local network to use your machine as a proxy. Make sure this is what you wanted. 13/07/2018, 20.51.53.000 [NOTICE] DisableNetwork is set. Tor will not make or accept non-control network connections. Shutting down all existing connections. 13/07/2018, 20.51.53.000 [WARN] Controller gave us config lines that didn't validate: Failed to bind one of the listener ports. I recommend deleting the application, and re-installing. 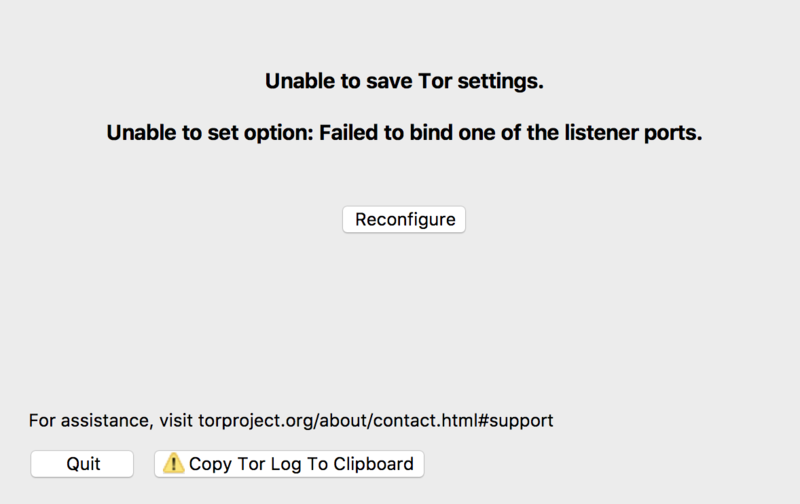 Download the version of Tor compatible with your machine from Tor Project. You can check whether your system is 64-bit or 32-bit by opening a terminal and typing getconf LONG_BIT. The number returned determines which version of Tor you will download. Not the answer you're looking for? Browse other questions tagged help mac connection or ask your own question.